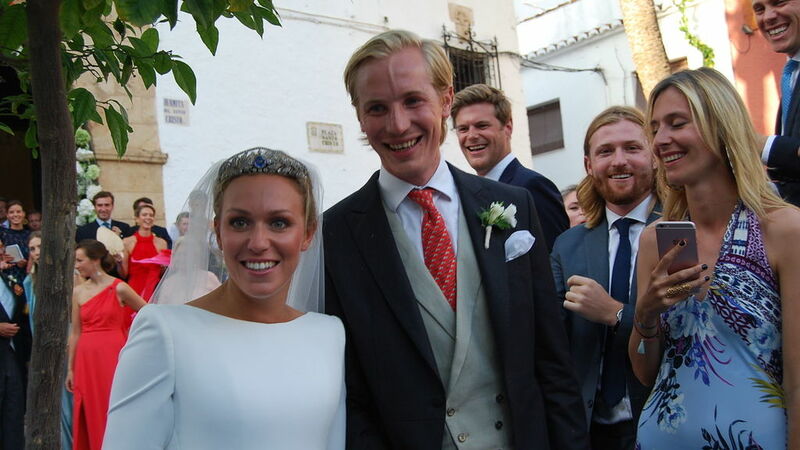 Princess Marie-Gabrielle and Antonius Willms said their "I Dos" in a religious wedding ceremony in Marbella, Spain, today. The couple was joined by some 300 family members and guests at the Iglesia del Santo Cristo. Princess Marie-Gabrielle wore a white wedding gown by Lorenzo Caprile adorned with flowers and some 10,000 Swarovski crystals. She anchored her veil with the Grand Duchess Adelaide Tiara. The oldest child and only daughter of Prince Jean and his former wife Hélène Vestur, who was given away by her father, offered her bouquet of flowers to the statue of the Virgin Mary after the ceremony. El Español has an article with a few pictures of the wedding today mixed with visuals of yesterday's pre-wedding party, that seems to have taken place at the Marbella Club instead of Llanis de Belvis, the estate own by the groom's sister and brother-in-law. While hopefully more and better photos will come in over the coming days, I can already tell you that the following members of the Grand Ducal Family attended the celebrations: Grand Duke Henri and Grand Duchess Maria Teresa, Hereditary Grand Duke Guillaume and Hereditary Grand Duchess Stéphanie, Prince Félix and Princess Claire, Prince Louis, Princess Alexandra, the bride's brothers Prince Constantin and Prince Carl, her cousins Princess Anunciata and Princess Astrid as well as her uncle Archduke Carl-Christian.